An L.A. county jail will be testing the Assault Intervention Device. Officials at a Los Angeles County jail plan to test out an invisible heat-beam weapon originally developed by the military as a way to subdue brawling inmates by making them feel "intolerable heat." The technology, called an Assault Intervention Device, is a non lethal-weapon developed by Raytheon Company. It originally was scaled down for use at the jail. The device "emits a focused beam of wave energy that travels at the speed of light and produces an intolerable heating sensation that causes targeted individuals to flee. The sensation immediately ceases when the targeted individual moves away from the beam," according to Raytheon's website. Deputies have tested the device, which is controlled by a jail officer using a joystick. "We believe that technology can help solve problems facing the corrections community, including addressing issues of inmate violence," Sheriff Lee Baca said during a news conference. "The Assault Intervention Device appears uniquely suited to address some of the more difficult inmate violence issues without the drawbacks of tools currently available to us." "This device will allow us to quickly intervene without having to enter the area and without incapacitating or injuring either combatant," Baca added. 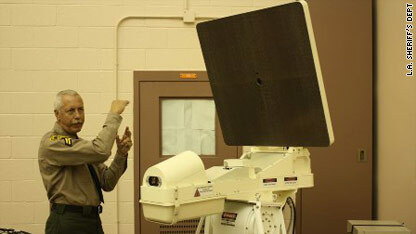 Officials say they hope the device can help quell inmate assaults and reduce prison violence. Its use will be monitored by the U.S. Department of Justice's National Institute of Justice and Pennsylvania State University. The device was installed and is being tested at Pitchess Detention Center at the L.A. County jail in Castaic, California. That jail was the site of a 200-inmate brawl this weekend in which inmates threw rocks and debris at officers, who were attempting to stop them from entering a restricted area, according to CNN affiliate KTLA. KTLA reported the brawl lasted for an hour before tear gas and non-lethal weapons were used. CNN is awaiting comment on whether the new Assault Intervention Device was employed during the brawl. What happens if the the victims of the 'heat ray' don't or aren't able to get away from it's projection? Will they be burnt up? What if the joystick operator gets a kick out of burning people? that his sister's inafnt, that he babysat ..smiled & enjoyed what he did. (I was so distraught upon hearing this I cried hysterically & vomitted) ** I think this horrible sandusky scandal..could focus attention on thisproblem (that has been around since the beginning of time..& happens all over the world) & turnthe problem into a WORLDWIDE HEALING & a firm stand..that abuse of any type will not betolerated. I think the officials should get sandusky off the streets..so the victims (no matter how young or old they might be now) will feel safe to speak .